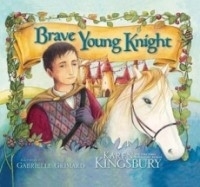 In this picture book, Karen Kingsbury tells the story of a boy in competition with other young knights to become prince of all the land. In a series of contests and competitions, the king recognizes the brave young knight as the winner, not because he was the fastest or strongest, and not because he was smarter or more cunning than the other knights. Rather, the brave young knight is the winner because he doesn't follow the crowd, instead making decisions based on what is right and true and in accordance with his faith. The moral of the story is that the bravest young boys are those who exhibit the strongest character. This simple, straightforward fairytale is an excellent story to reaffirm in children a sense of right and wrong. Through the example of the one knight who did not follow the crowd, even though he thought it would cost him the honor of his village, the story explores the kinds of values that make a person honorable and courageous. It also depicts those kinds of behaviors, namely cheating, that are not part of a godly or good character. The father in the story is also an excellent example of what a true father looks for in his children. The illustrations in this book are icing on the cake: detailed, bright, and creatively rendered castles, landscapes, people and costumes jump off the page and bring the story to life. Grimard's work is stunning and a great choice to accompany such a grand storyline.